So this time last weekend, Suzi and I were already a few Bloody Marys deep and trying to figure out how to win $500. 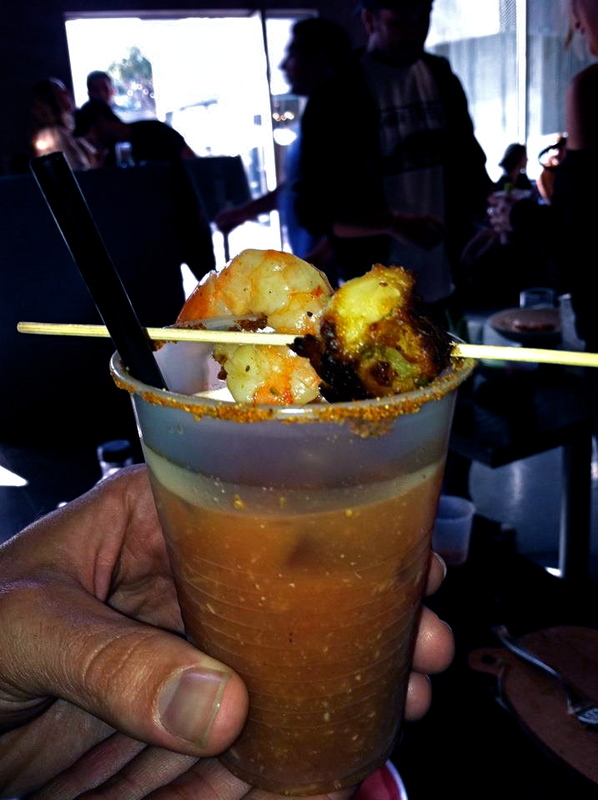 Our GM at R+D, Steve, entered us in a competition for the “Best Bloody Mary in the West”. 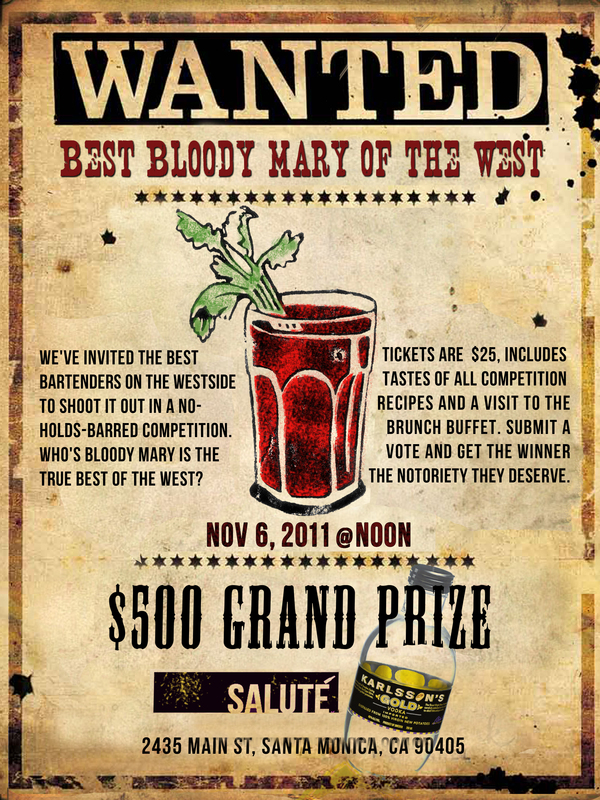 It was a competition where any bartender on the Westside could come and compete with their finest Bloody Mary recipe. Steve entered us Saturday night around 9PM. The competition was at noon Sunday. AND Suzi and I were closing the bar Saturday night. Thank goodness Daylight Savings Time gave us an extra hour. So Suzi and I left work about 12:30 Saturday night and went to my apartment to plan. We Googled, we made lists, and we came up with some solid Bloody Mary ideas. Then we went out to find a 24 hour grocery store. Have you ever been to a grocery store at 1AM on a Saturday night/Sunday morning? It is a really special place. People are either super drunk and really wobbly or in their PJs and kind of crazy. There is usually just one cash register open and the line is extremely entertaining. There were keys ripping open guacamole containers and girls buying containers of icing with no cake mix to put it on. There were cookie containers with maybe a cookie or two left (scratch that, that was Brad) and lots of frozen pizzas. Poor cashier. I’ll say it again. Ralphs at 1AM is a very special place. But we got home and got to work. This is what my stove looked like around 2AM. 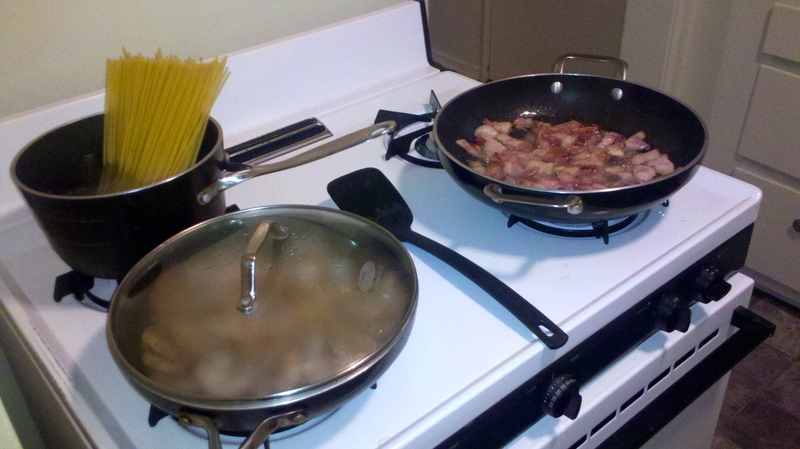 We were frying bacon, making Old Bay Shrimp, and I was hungry so I was making spaghetti (big surprise). Our plan was to submit two entries. 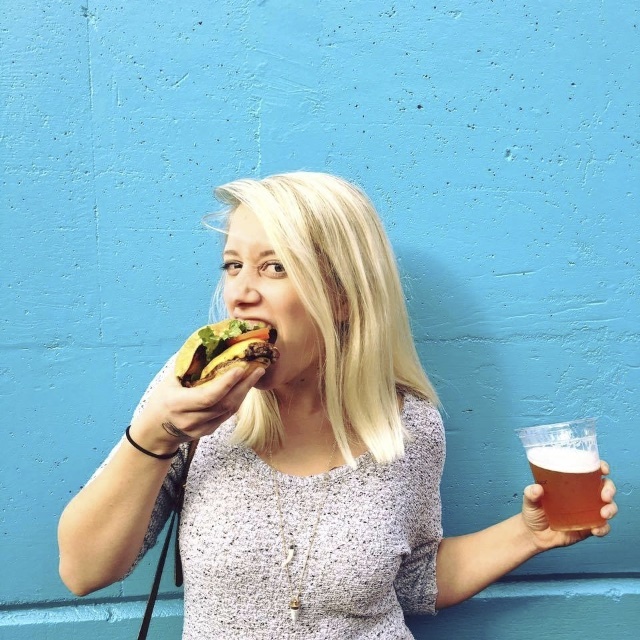 Suzi would make a BLT Bloody Mary with Bacon infused vodka, a Mayo and Breadcrumb rim, and Charred Frisee garnish. I was taking the Maryland approach. A Crabby Mary that used as much crab as I could get into it. So at 2AM we prepped. We fried bacon. We did a speedy bacon vodka infusion that had to sit overnight. I made Old Bay Shrimp. And we ate spaghetti. Because that is all good to do at 2AM. I went to sleep about 4AM. At 7:30, I woke up and went to Whole Foods for some blue crab meat. Suzi came back over around 9, and then we got to work fo realz. On 3.5 hours of sleep. Ugh. 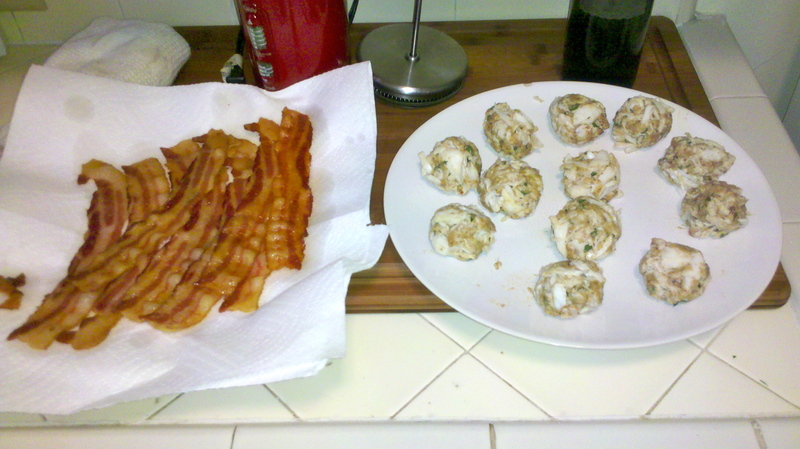 We fried up more bacon and then I made some mini crab cakes for garnishes. They were some of my finest work. I’ll even say amazeballs, because they were, in fact, balls. Appropriate. 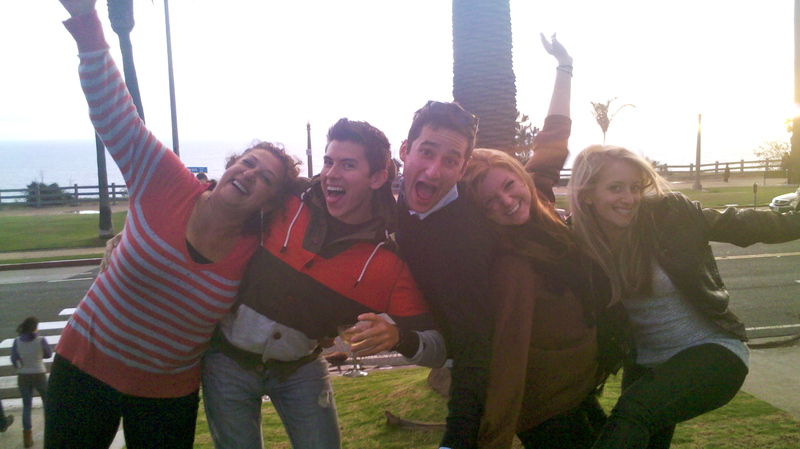 So a little trial and error, a little scraping congealed bacon fat off of vodka, a few sample Bloody Marys drunk, and we were off to Salute Wine Bar on Main St in Santa Monica. And then we got there…. The set up was like this. Here is a table to put your stuff on. Here are 150 plastic cups to serve 150 samples to the brunch guests from noon until 3pm. Here is some ice. Oh and here is a bottle of vodka. Yea, so I had twelve crab cakes. TWELVE. And I ate one of them that morning, of course. (Quality control. Anyone who has ever watched Top Chef knows this is super important…) So I had ELEVEN crab cake garnishes for 150 samples. And not to mention, Suzi and I had only two jars of V8 between the two of us. Ok, so this obviously applies here because if your Bloody Mary isn’t red, there is something seriously wrong. But “Make it Red” really refers to just making it work and making it taste good. When some tipsy college kid asked me for a “Twisted-Surfer-Whose-Hair-is-On-Fire” shot or something, you just smile and make it red. Truth is, some bartender probably made that ridiculous concoction up somewhere and the kid has no freaking idea what’s in it. So make it red, make it strong, and make it delicious. Suzi and I consolidated. We scratched the BLT because we definitely didn’t bring enough of the bacon infused vodka to last 150 samples. (But Suz made one for Steve once he got there and it was DELISH. Next year….) We broke the crab cakes into 3 pieces each. We garnished some with just the Old Bay shrimp. 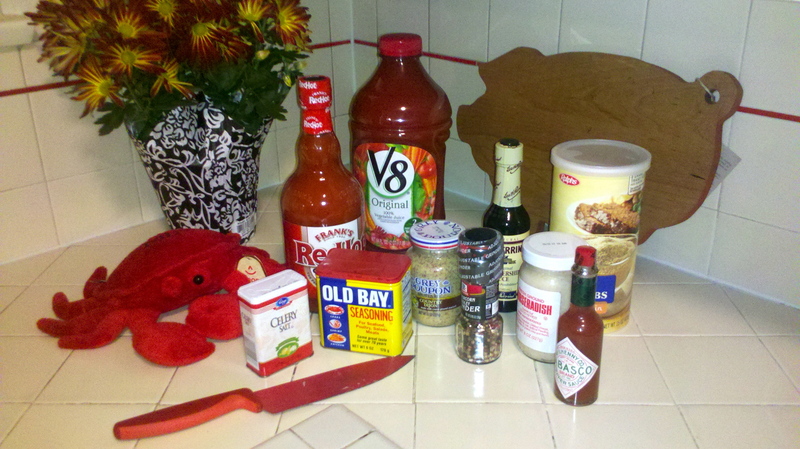 I only added half of the amount of blue crab shaken into the Crabby Marys and added way more Old Bay. We worked the one-eyed stuffed animal crab. We worked our charm. And I called our GM to bring us a shaker so I could actually function. In reality, 150 was a gross over-exaggeration. 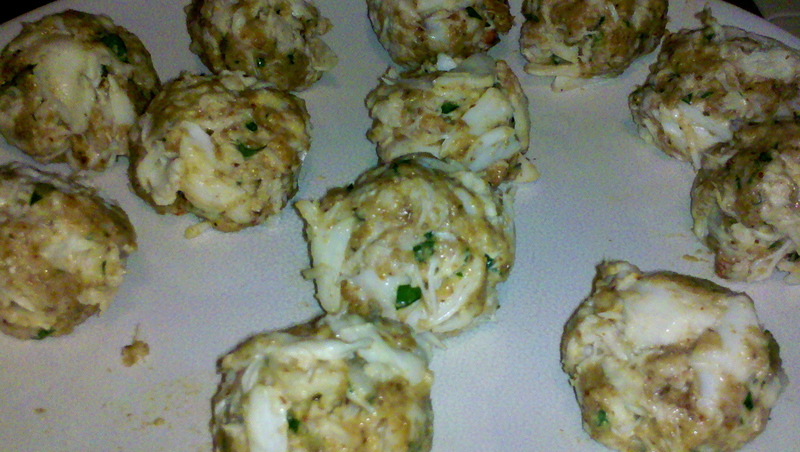 We probably only made about 80 samples, and only ran out of crab meat for the very last two. People loved the crab cakes and I heard so many nostalgic stories about summers or childhoods spent in Maryland. I reminisced with people about Annapolis and Ocean City. We talked about the Ravens and the Orioles. It made me homesick and happy, and it was well worth getting my $$ Sunday bar tending shift covered. We came in second place behind a bartender from a bar right down the street who was absolutely more prepared than we were. But we only lost by 3 votes, which I thought was a great victory. The $500 Grand Prize would have been nice, but we spent the rest of the night drinking champagne, dancing, wearing funny hats, watching the sunset and hanging out with amazing new (and old) friends at a beautiful apartment right on Ocean Ave in Santa Monica. next year. and count me in! love this SO much.